1. 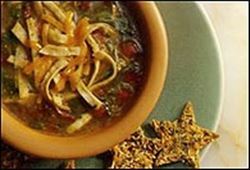 Combine the chicken broth, tomatillos, garlic cloves, onion, chili powder and Anaheim chiles in a large saucepan and simmer until the vegetables are tender, about 20 minutes. 2. Puree the soup mixture in a food processor or blender. Return it to the saucepan and add the tomatoes, parsley and chicken. Simmer for 15 minutes and season to taste. 3. Place the tortilla strips on an ungreased baking pan and spray lightly with vegetable spray. Bake at 350 degrees for 15 minutes, or until lightly browned. 4. Ladle soup into bowls. Top with tortilla strips and cheese; serve immediately. Serve with Poppy Seed Cheese Chips. Enjoy this delicious tortilla soup Mexican recipe!